pure fission weapons, the simplest and least technically demanding, were the first nuclear weapons built and have so far been the only type ever used in an act of war (over wartime Japan). boosted fission weapons improve on the implosion design using small quantities of fusion fuel to enhance the fission chain reaction. Boosting can more than double the weapon's fission energy yield. staged thermonuclear weapons are essentially arrangements of two or more "stages", most usually two. The first stage is always a boosted fission weapon as above. Its detonation causes it to shine intensely with x-radiation, which illuminates and implodes the second stage filled with a large quantity of fusion fuel. This sets in motion a sequence of events which results in a thermonuclear, or fusion, burn. This process affords potential yields up to hundreds of times those of fission weapons. A fourth type, pure fusion weapons, is a purely theoretical possibility. Such weapons would produce far less radioactive byproducts than current designs, although they would release huge numbers of neutrons. Pure fission weapons historically have been the first type to be built by new nuclear powers. Large industrial states with well-developed nuclear arsenals have two-stage thermonuclear weapons, which are the most compact, scalable, and cost effective option once the necessary technical base and industrial infrastructure are built. Once the critical mass is assembled, at maximum density, a burst of neutrons is supplied to start as many chain reactions as possible. Early weapons used a modulated neutron generator codenamed "Urchin" inside the pit containing polonium-210 and beryllium separated by a thin barrier. Implosion of the pit crushed the neutron generator, mixing the two metals, thereby allowing alpha particles from the polonium to interact with beryllium to produce free neutrons. In modern weapons, the neutron generator is a high-voltage vacuum tube containing a particle accelerator which bombards a deuterium/tritium-metal hydride target with deuterium and tritium ions. The resulting small-scale fusion produces neutrons at a protected location outside the physics package, from which they penetrate the pit. This method allows better control of the timing of chain reaction initiation. Since boosting is required to attain full design yield, any reduction in boosting reduces yield. Boosted weapons are thus variable-yield weapons (also known as dial-a-yield); yield can be reduced any time before detonation simply by reducing the amount of deuterium/tritium inserted into the pit during the arming procedure. The entire fusion fuel canister would need to be enveloped by fission energy, to both compress and heat it, as with the booster charge in a boosted primary. The design breakthrough came in January 1951, when Edward Teller and Stanislaw Ulam invented radiation implosion—for nearly three decades known publicly only as the Teller-Ulam H-bomb secret. Warhead designs after 1960 took on the character of model changes, with every new missile getting a new warhead for marketing reasons. The chief substantive change involved packing more fissile uranium-235 into the secondary, as it became available with continued uranium enrichment and the dismantlement of the large high-yield bombs. 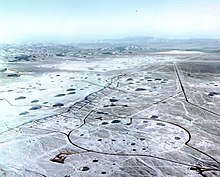 Starting with the Nova facility at Livermore in the mid-1980s, nuclear design activity pertaining to radiation-driven implosion was informed by research with indirect drive laser fusion. This work was part of the effort to investigate Inertial Confinement Fusion. Similar work continues at the more powerful National Ignition Facility. The Stockpile Stewardship and Management Program also benefitted from research performed at NIF. ^ The physics package is the nuclear explosive module inside the bomb casing, missile warhead, or artillery shell, etc., which delivers the weapon to its target. While photographs of weapon casings are common, photographs of the physics package are quite rare, even for the oldest and crudest nuclear weapons. For a photograph of a modern physics package see W80. ^ Life Editors (1961), "To the Outside World, a Superbomb more Bluff than Bang", Life, New York (Vol. 51, No. 19, November 10, 1961), pp. 34–37, retrieved 2010-06-28 CS1 maint: Extra text: authors list (link). Article on the Soviet Tsar Bomba test. Because explosions are spherical in shape and targets are spread out on the relatively flat surface of the earth, numerous smaller weapons cause more destruction. From page 35: "... five five-megaton weapons would demolish a greater area than a single 50-megatonner." ^ The United States and the Soviet Union were the only nations to build large nuclear arsenals with every possible type of nuclear weapon. The U.S. had a four-year head start and was the first to produce fissile material and fission weapons, all in 1945. The only Soviet claim for a design first was the Joe 4 detonation on August 12, 1953, said to be the first deliverable hydrogen bomb. However, as Herbert York first revealed in The Advisors: Oppenheimer, Teller and the Superbomb (W.H. Freeman, 1976), it was not a true hydrogen bomb (it was a boosted fission weapon of the Sloika/Alarm Clock type, not a two-stage thermonuclear). 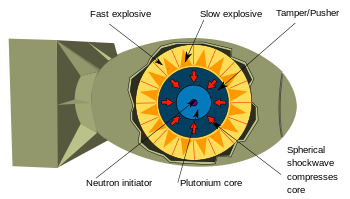 Soviet dates for the essential elements of warhead miniaturization – boosted, hollow-pit, two-point, air lens primaries – are not available in the open literature, but the larger size of Soviet ballistic missiles is often explained as evidence of an initial Soviet difficulty in miniaturizing warheads. ^ The main source for this section is Samuel Glasstone and Philip Dolan, The Effects of Nuclear Weapons, Third Edition, 1977, U.S. Dept of Defense and U.S. Dept of Energy (see links in General References, below), with the same information in more detail in Samuel Glasstone, Sourcebook on Atomic Energy, Third Edition, 1979, U.S. Atomic Energy Commission, Krieger Publishing. ^ Glasstone and Dolan, Effects, p. 12. ^ Glasstone, Sourcebook, p. 503. ^ "neutrons carry off most of the reaction energy", Glasstone and Dolan, Effects, p. 21. ^ a b Glasstone and Dolan, Effects, p. 21. ^ Martin, James E. Physics for Radiation Protection. WILEY-VCH Verlag GmbH & Co. KGaA, Weinheim, 2006, p. 195. ^ Glasstone and Dolan, Effects, p. 12–13. When 454 g (one pound) of U-235 undergoes complete fission, the yield is 8 kilotons. The 13 to 16-kiloton yield of the Little Boy bomb was therefore produced by the fission no more than 2 pounds (910 g) of U-235, out of the 141 pounds (64,000 g) in the pit. The remaining 139 pounds (63 kg), 98.5% of the total, contributed nothing to the energy yield. ^ Compere, A.L., and Griffith, W.L. 1991. "The U.S. Calutron Program for Uranium Enrichment: History,. Technology, Operations, and Production. Report", ORNL-5928, as cited in John Coster-Mullen, "Atom Bombs: The Top Secret Inside Story of Little Boy and Fat Man", 2003, footnote 28, p. 18. The total wartime output of Oralloy produced at Oak Ridge by July 28, 1945 was 165 pounds (74.68 kg). Of this amount, 84% was scattered over Hiroshima (see previous footnote). ^ Hoddeson, Lillian; et al. (2004). Critical Assembly: A Technical History of Los Alamos During the Oppenheimer Years, 1943-1945. Cambridge University Press. p. 271. ISBN 978-0-521-54117-6. ^ "Restricted Data Declassification Decisions from 1945 until Present" Archived April 23, 2016, at the Wayback Machine – "Fact that plutonium and uranium may be bonded to each other in unspecified pits or weapons." ^ "Restricted Data Declassification Decisions from 1946 until Present". Retrieved 7 October 2014. ^ All information on nuclear weapon tests comes from Chuck Hansen, The Swords of Armageddon: U.S. Nuclear Weapons Development since 1945, October 1995, Chucklea Productions, Volume VIII, p. 154, Table A-1, "U.S. Nuclear Detonations and Tests, 1945–1962". ^ Nuclear Weapons FAQ: 4.1.6.3 Hybrid Assembly Techniques Archived April 19, 2016, at the Wayback Machine, accessed December 1, 2007. Drawing adapted from the same source. ^ Nuclear Weapons FAQ: 4.1.6.2.2.4 Cylindrical and Planar Shock Techniques Archived April 19, 2016, at the Wayback Machine, accessed December 1, 2007. ^ "Restricted Data Declassification Decisions from 1946 until Present", Section V.B.2.k Archived April 23, 2016, at the Wayback Machine "The fact of use in high explosive assembled (HEA) weapons of spherical shells of fissile materials, sealed pits; air and ring HE lenses", declassified November 1972. ^ 4.4 Elements of Thermonuclear Weapon Design Archived March 11, 2016, at the Wayback Machine. Nuclearweaponarchive.org. Retrieved on 2011-05-01. ^ Until a reliable design was worked out in the early 1950s, the hydrogen bomb (public name) was called the superbomb by insiders. After that, insiders used a more descriptive name: two-stage thermonuclear. Two examples. From Herb York, The Advisors, 1976, "This book is about ... the development of the H-bomb, or the superbomb as it was then called." p. ix, and "The rapid and successful development of the superbomb (or super as it came to be called) ..." p. 5. From National Public Radio Talk of the Nation, November 8, 2005, Siegfried Hecker of Los Alamos, "the hydrogen bomb – that is, a two-stage thermonuclear device, as we referred to it – is indeed the principal part of the US arsenal, as it is of the Russian arsenal." ^ a b Howard Morland, "Born Secret", Cardozo Law Review, March 2005, pp. 1401–1408. ^ Kemp, Ted (3 September 2017). "North Korea hydrogen bomb: Read the full announcement from Pyongyang". CNBC News. Retrieved 5 September 2017. ^ "Israel's Nuclear Weapon Capability: An Overview". www.wisconsinproject.org. Archived from the original on 2015-04-29. Retrieved 2016-10-03. ^ "Improved Security, Safety & Manufacturability of the Reliable Replacement Warhead", NNSA March 2007. ^ A 1976 drawing Archived April 3, 2016, at the Wayback Machine which depicts an interstage that absorbs and re-radiates x-rays. From Howard Morland, "The Article", Archived March 22, 2016, at the Wayback Machine Cardozo Law Review, March 2005, p 1374. ^ Ian Sample (6 March 2008). "Technical hitch delays renewal of nuclear warheads for Trident". The Guardian. ^ "SAND8.8 – 1151 Nuclear Weapon Data – Sigma I", Archived April 23, 2016, at the Wayback Machine Sandia Laboratories, September 1988. ^ The Greenpeace drawing. Archived March 15, 2016, at the Wayback Machine From Morland, Cardozo Law Review, March 2005, p 1378. ^ Herbert York, The Advisors: Oppenheimer, Teller and the Superbomb (1976). ^ "The 'Alarm Clock' ... became practical only by the inclusion of Li6 (in 1950) and its combination with the radiation implosion." Hans A. Bethe, Memorandum on the History of Thermonuclear Program Archived March 4, 2016, at the Wayback Machine, May 28, 1952. ^ Rhodes 1995, p. 256. ^ 4.5 Thermonuclear Weapon Designs and Later Subsections Archived March 3, 2016, at the Wayback Machine. Nuclearweaponarchive.org. Retrieved on 2011-05-01. ^ Operation Hardtack I Archived September 10, 2016, at the Wayback Machine. Nuclearweaponarchive.org. Retrieved on 2011-05-01. ^ Operation Redwing Archived September 10, 2016, at the Wayback Machine. Nuclearweaponarchive.org. Retrieved on 2011-05-01. ^ Barnaby, Frank (2012-08-21). The Role and Control of Weapons in the 1990s. ISBN 9781134901913. ^ "Bulletin of the Atomic Scientists". Educational Foundation for Nuclear Science, Inc. March 1991. ^ SDI : Technology, survivability, and software. ISBN 9781428922679. ^ Ramsey, Syed (2016-05-12). Tools of War: History of Weapons in Modern Times. ISBN 9789386019837. ^ "Details on antimatter triggered fusion bombs". 2015-09-22. ^ Weapon and Technology: 4th Generation Nuclear Nanotech Weapons Archived September 24, 2014, at the Wayback Machine. Weapons.technology.youngester.com (2010-04-19). Retrieved on 2011-05-01. ^ Fourth Generation Nuclear Weapons Archived March 23, 2016, at the Wayback Machine. Nuclearweaponarchive.org. Retrieved on 2011-05-01. ^ Never say "never" Archived April 18, 2016, at the Wayback Machine. Whyfiles.org. Retrieved on 2011-05-01. ^ Samuel Glasstone, The Effects of Nuclear Weapons, 1962, Revised 1964, U.S. Dept of Defense and U.S. Dept of Energy, pp.464–5. This section was removed from later editions, but, according to Glasstone in 1978, not because it was inaccurate or because the weapons had changed. ^ "Nuclear Weapons FAQ: 1.6". ^ Ramzaev, V; Repin, V; Medvedev, A; Khramtsov, E; Timofeeva, M; Yakovlev, V (2011). "Radiological investigations at the "Taiga" nuclear explosion site: Site description and in situ measurements". Journal of Environmental Radioactivity. 102 (7): 672–680. doi:10.1016/j.jenvrad.2011.04.003. PMID 21524834. Retrieved 7 October 2014. ^ Ramzaev, V; Repin, V; Medvedev, A; Khramtsov, E; Timofeeva, M; Yakovlev, V (2012). "Radiological investigations at the "Taiga" nuclear explosion site, part II: man-made γ-ray emitting radionuclides in the ground and the resultant kerma rate in air". Journal of Environmental Radioactivity. 109: 1–12. doi:10.1016/j.jenvrad.2011.12.009. PMID 22541991. Retrieved 7 October 2014. ^ "Why the H-Bomb Is Now Called the 3-F". LIFE. Time Inc: 54–55. December 5, 1955. ^ Winterberg, Friedwardt (2010). The Release of Thermonuclear Energy by Inertial Confinement: Ways Towards Ignition. World Scientific. pp. 192–193. ISBN 978-9814295918. ^ Croddy, Eric A.; Wirtz, James J.; Larsen, Jeffrey, Eds. (2005). Weapons of Mass Destruction: An Encyclopedia of Worldwide Policy, Technology, and History. ABC-CLIO, Inc. p. 376. ISBN 978-1-85109-490-5. ^ a b How much large can bombs be made through staging? One often finds claims on the public Internet that multiple stages could be combined one after the other, in an arbitrary large number, and that therefore the in-principle yield of a thermonuclear could be increased without limit. Such authors usually conclude this argument with the wise statement that nuclear weapons were made already so destructive, that no one could possibly think of increasing their yield even further, or that their military use would be pointless...The idea of adding four, ten, a hundred stages, in a disciplined and well orderly way, driving a larger radiation-driven implosion after the other sounds much more like a sheer nonsense than an in-principle design for an Armageddon-class weapon. It should be added that, to the best knowledge of this author, statements about the actual yield of the most powerful weapons in the U.S. nuclear arsenal, either deployed or envisaged at some stage, were declassified, but no detailed hints at triple staging were released in the open from official sources. Also, there are (convincing) well-known sketches and some reasonable-looking calculations in the open literature about two-stage weapons, but no similarly accurate descriptions of true three stages concepts. "Archived copy". Archived from the original on 2016-03-05. Retrieved 2013-05-22. CS1 maint: Archived copy as title (link). ^ The Air Force and Strategic Detterence 1951–1960. USAF historical division LIAISON OFFICE by George F. Lemmer 1967. Formerly restricted data Archived June 17, 2014, at the Wayback Machine. ^ Bowen and Little, "AF Atomic Energy Program" Vol I-V RS. Authors: Lee Bowen and Stuart Little. ^ "A new use for nuclear weapons: hunting rogue asteroids A persistent campaign by weapons designers to develop a nuclear defense against extraterrestrial rocks slowly wins government support 2013". Center for Public Integrity. 2013-10-16. Retrieved 7 October 2014. ^ Jason Mick (October 17, 2013). "The mother of all bombs would sit in wait in an orbitary platform". Archived from the original on October 9, 2014. ^ Weaver, Thomas A; Wood, Lowell (1979). "Necessary conditions for the initiation and propagation of nuclear-detonation waves in plane atmospheres Phys. Rev. A 20, 316 – Published 1 July 1979 Thomas A. Weaver and Lowell Wood". Physical Review A. 20: 316–328. doi:10.1103/PhysRevA.20.316. ^ "Neutron bomb: Why 'clean' is deadly". BBC News. July 15, 1999. Retrieved January 6, 2010. ^ Broad, William J. (7 September 1999), "Spies versus sweat, the debate over China's nuclear advance", The New York Times, p 1. The front page drawing Archived May 5, 2016, at the Wayback Machine was similar to one that appeared four months earlier in the San Jose Mercury News. ^ Jonathan Medalia, "The Reliable Replacement Warhead Program: Background and Current Developments", CRS Report RL32929 Archived March 11, 2016, at the Wayback Machine, Dec 18, 2007, p CRS-11. ^ Richard Garwin, "Why China Won't Build U.S. Warheads" Archived November 5, 2005, at the Wayback Machine, Arms Control Today, April–May 1999. ^ William J. Broad, "The Hidden Travels of The Bomb: Atomic insiders say the weapon was invented only once, and its secrets were spread around the globe by spies, scientists and the covert acts of nuclear states", New York Times, December 9, 2008, p D1. ^ Server, Robert (1992). The Los Alamos Primer (1st ed.). Berkeley, California: University of California Press. ISBN 9780520075764. ^ Sybil Francis, Warhead Politics: Livermore and the Competitive System of Nuclear Warhead Design, UCRL-LR-124754, June 1995, Ph.D. Dissertation, Massachusetts Institute of Technology, available from National Technical Information Service. This 233-page thesis was written by a weapons-lab outsider for public distribution. The author had access to all the classified information at Livermore that was relevant to her research on warhead design; consequently, she was required to use non-descriptive code words for certain innovations. ^ Walter Goad, Declaration for the Wen Ho Lee case Archived March 8, 2016, at the Wayback Machine, May 17, 2000. Goad began thermonuclear weapon design work at Los Alamos in 1950. In his Declaration, he mentions "basic scientific problems of computability which cannot be solved by more computing power alone. These are typified by the problem of long range predictions of weather and climate, and extend to predictions of nuclear weapons behavior. This accounts for the fact that, after the enormous investment of effort over many years, weapons codes can still not be relied on for significantly new designs." ^ Chuck Hansen, The Swords of Armageddon, Volume IV, pp. 211–212, 284. ^ Hansen, Chuck (1995). Swords of Armageddon. IV. Retrieved 2016-05-20. ^ Hansen, Chuck (1995). Swords of Armageddon. III. Retrieved 2016-05-20. ^ Dr. John C. Clark, as told to Robert Cahn, "We Were Trapped by Radioactive Fallout", The Saturday Evening Post, July 20, 1957, pp. 17–19, 69–71. ^ Rhodes, Richard (1995). Dark Sun; the Making of the Hydrogen Bomb. Simon and Schuster. p. 541. ^ Chuck Hansen, The Swords of Armageddon, Volume VII, pp. 396–397. ^ Sybil Francis, Warhead Politics, pp. 141, 160. ^ Harvey, John R.; Michalowski, Stefan (1994). "Nuclear Weapons Safety:The Case of Trident" (PDF). Science & Global Security. 4.